Finally, Jaguar will be up against German manufacturers including BMW and Audi in the competitive compact executive segment, with its new XE. If you’ve not already heard about the XE, where have you been? Its first UK reveal was a multi-million pound extravaganza in London, featuring helicopters and Emeli Sande. But finally, the public get to see it properly for the first time at the Paris Motor Show 2014. The Jaguar XE looks exactly like you’d expect a baby Jag to look – very similar to the bigger XF, with clear influences from the F-Type sports car. There’s a reason for that, Jaguar needs the XE to sell in big numbers, so it can’t risk scaring off customers by being too radical. A number of new engines have been introduced for the Jaguar XE, starting with two 2.0-litre diesels, producing 163hp and 180hp. The lower-power unit averages 75mpg and emits 99g/km CO2. The same 340hp V6 from the F-Type tops the range, while buyers also get a choice of 200hp and 240hp 2.0-litre turbocharged petrol engines. The XE is rear-wheel drive, around 4.7 metres long and, as it’s made from 75% aluminium, a kerb weight from under 1,500kg should ensure strong on-road dynamics. The Jaguar XE’s interior is more spacious than we expected, but the quality isn’t quite a match for the new Mercedes-Benz C-Class. Nothing in this class is. Everything in the XE’s cabin is centred around the all-new 8.0-inch touchscreen, which features ‘InControl’ apps and replaces Jaguar’s current outdated system. 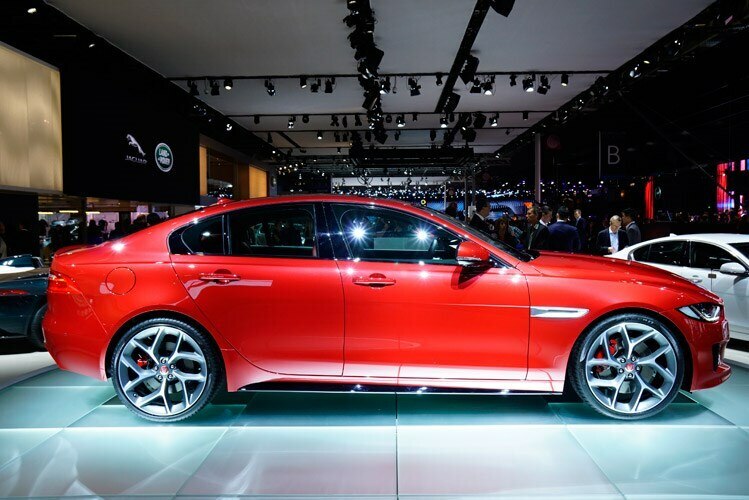 Deliveries of the Jaguar XE will start in May 2015, and will (Jaguar hopes) tempt company car drivers out of the default BMW 3 Series choice. Prices start at £26,995 – or £29,775 in 2.0D 163 SE guise (this is the 75mpg, 99g/km CO2 model).